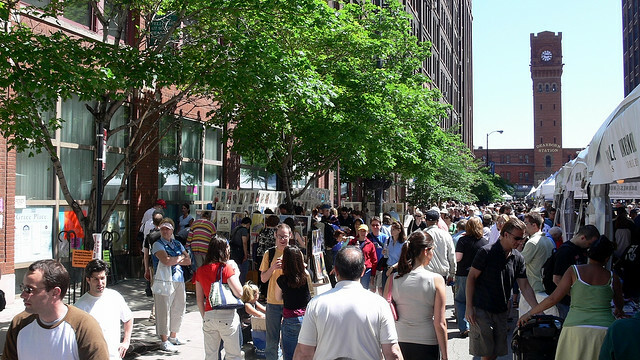 The Midwest’s largest literary event? Dispatch just in from our Department of All Things Reference and Regional about annual Chicago favorite, the Printers Row List Fest: Come out and join us this weekend at the 2011 Printers Row Lit Fest, one of the most anticipated events of the year for authors, publishers, booksellers, and book lovers in Chicago. Among the bookstalls and reading stages occupying five city blocks in the South Loop, you’ll find the University of Chicago Press booth on Dearborn just south of Harrison. We’ll be selling some of our most popular regional and general interest titles at great prices, including The Thinking Student’s Guide to College by Andrew Roberts for $10 and a table full of books such as the The Rules of Golf in Plain English and The University of Chicago Spanish Dictionary for just $5. While you’re there, catch our distinguished authors speaking at the following events: 10:00 AM on Saturday at University Center/River Room Hillary Chute, author of Graphic Women and Melissa Ann Pinney, author of Girl Ascending, in conversation with Mary Schmich of the Chicago Tribune 10:30 AM on Saturday at University Center/Loop Room Adoption Nation with Jane Katch, author of Far Away from the Tigers: . . . Welcome back to TRAFFIC, a Chicago Blog series featuring leading figures from across the humanities and sciences, whose prescient views on current events help us to interpret contemporary culture. We’ll be ending a month of Friday TRAFFIC features, led by popular science writer Carl Zimmer, with one final conversation about ocean-borne viruses with Penny Chisholm. Sallie W. “Penny” Chisholm is the Lee and Geraldine Martin Professor of Environmental Studies and professor of biology at MIT. Her research lab seeks to advance our understanding of the ecology and evolution of microbes in the oceans, and how they influence global biochemical cycles. In January 2010, she was awarded the Alexander Agassiz Medal, for “pioneering studies of the dominant photosynthetic organisms in the sea and for integrating her results into a new understanding of the global ocean.” A Billion Viruses in the Sea Dear Carl, Thank you for giving viruses the recognition they deserve. As you point out, the discovery of viruses in the oceans is relatively recent. It seems that about once every decade there are similar major discoveries in oceanography that change the way we think about ocean ecosystems. One of these—a discovery by the late John Martin—was that iron availability . . . Welcome back to TRAFFIC, a Chicago Blog series featuring leading figures from across the humanities and sciences, whose prescient views on current events help us to interpret contemporary culture. We’re delighted to continue this month’s Friday TRAFFIC features, led by popular science writer Carl Zimmer. This week Zimmer welcomes MIT scientist Timothy Lu to talk about the quest to use viruses to cure infectious diseases. Timothy Lu is assistant professor of electrical engineering at MIT, where he heads the Synthetic Biology Group. Carl wrote a profile of Lu last year in Technology Review. All About Phage Therapy Dear Carl: Bacteriophages are the most abundant biological particles on earth, but due to their size, and perhaps ubiquity, most of us don’t think of them very often. Phages are essentially just bacterial viruses. When it comes to viruses, the popular notion is that they are bad entities that are responsible for disease and suffering. The truth is, however, that phages are very different from human viruses. Phages do not infect human cells and are not responsible for the viral diseases that plague mankind, such as AIDS, herpes, cervical cancer, and the common cold. Furthermore, phages have had a tremendous impact on modern . . . Welcome back to TRAFFIC, a Chicago Blog series featuring leading figures from across the humanities and sciences, whose prescient views on current events help us to interpret contemporary culture. We’re delighted to continue this month’s Friday TRAFFIC features, led by popular science writer Carl Zimmer. This week Zimmer welcomes Richard Preston, New Yorker contributor and bestselling author, for a conversation on smallpox and the possible eradication of other viruses. Richard Preston is the author of seven books, including The Hot Zone, The Cobra Event, and The Demon in the Freezer. He is a regular contributor to the New Yorker, and his awards include the American Institute of Physics Award and the National Magazine Award. Preston also the only person who isn’t a medical doctor ever to receive the Centers for Disease Control’s Champion of Prevention Award for public health. Should Smallpox Be Put To Death? Dear Carl: There’s a debate in the scientific community about what to do with the remaining stocks of smallpox virus on the planet. Should the virus be preserved so that it can be studied? Or should the virus be destroyed, so that—in theory at least—it would become extinct and would not threaten the human species . . . Welcome to TRAFFIC, a series exclusive to the Chicago Blog presenting an exchange of thoughts between leading figures from across the humanities and sciences, whose prescient views on current events help us to interpret contemporary culture. We’re delighted to begin a month’s worth of Friday TRAFFIC posts helmed by popular science writer Carl Zimmer in collaboration with some of our most acclaimed virologists, immunologists, and scientifically minded journalists. Please join us for the next four weeks in welcoming discussions on virology and immunology with W. Ian Lipkin, director of the Center for Infection and Immunity; small pox with Richard Preston, New Yorker writer and bestselling author; phage therapy with Timothy Lu, inventor and Novophage founder; and ocean viruses with Sallie Chisholm, biological oceanographer and marine science expert. With that in mind, join us for our first TRAFFIC exchange with Zimmer and Lipkin below: The New York Times calls Carl Zimmer “as fine a science essayist as we have.” In his widely admired books, essays, and blogs, Zimmer charts the frontiers of biology. Booklist acclaimed his most recent title A Planet of Viruses as “absolutely top-drawer popular science writing.” Zimmer is a lecturer at Yale University, where he teaches writing about . . .